When distributed control systems (DCS) first appeared on the industrial automation scene in the mid-1970s, the focus was on control and operator interface. While control and human machine interface (HMI) are still important, today's DCSs have evolved to place increased emphasis on integrating plant-wide asset and operational information to enable operational excellence. Furthermore, automation suppliers have moved away from the proprietary hardware, software, and communications of the past, incorporating commercial-off-the-shelf (COTS) technologies where practical and appropriate to do so. At the same time, plant engineering and operations groups have adopted many of the same standards already in place at the enterprise IT level, and today's DCSs reflect this. With the development of CENTUM VP Release 5, Yokogawa is making effective use of integrated information at the field, subsystem and plant level, to meet new customer challenges." To help meet current global competitive, sustainability, and regulatory compliance challenges, personnel at all level of the plant – from process control operators, to maintenance technicians, to engineers, to the plant manager – require more data and higher quality information in real time to be able to make the right operating decisions. This includes decisions that affect not only product quality and volume; but also business decisions centered on costs; customer requirements; production, automation, and human assets; and – ultimately – plant profitability. This has created a technology burden on the DCS, requiring the systems to be able to interoperate with an ever-expanding variety of plant devices, systems, and applications; and process and manage huge amounts of data. CENTUM VP Release 5 represents the seventh generation of CENTUM. In response, leading automation suppliers, such as Yokogawa, must constantly invest in new developments to ensure that their automation solutions can provide the prerequisite performance, control and information management capabilities, and openness – and to do so in a safe, secure, and highly reliable manner. The real trick here is that they must do so without obsoleting the systems their customers already have in place. In 2011, Yokogawa introduced CENTUM VP Release 5, which incorporates the company's latest control and information management enhancements to its widely used and well proven DCS platform. Newly introduced products include the latest Field Control Station (FCS) with four times the processing performance of the previous controller; the Unified Gateway Station (UGS) that integrates with and provides a common user interface for Yokogawa and third-party subsystems; and significantly enhanced, plant-wide alarm management capabilities. Yokogawa introduced the company's CENTUM system in 1975 (which makes it one of the world's first distributed control systems) and has continually upgraded and enhanced the platform in the ensuing years. Today, well over 23,000 CENTUM systems are installed worldwide, largely in refineries, petrochemical plants, chemical plants, power plants, pulp & paper mills, and other process plants where robust, reliable control and non-stop availability are prerequisites. According to ARC Advisory Group's most recent Worldwide DCS Market Outlook study, CENTUM remains one of the leading DCSs globally across all vertical market segments, and is the leading DCS in the global chemicals segment. Because of the distributed architectural nature of the DCS functions, parts of the system can be replaced to stay current with technology without replacing the complete system. This has allowed CENTUM to evolve over the years as the technology and customer challenges have changed. CENTUM VP represents the seventh generation of CENTUM systems. CENTUM VP Release 5 maintains the high process control availability, high system performance, and backwards compatibility with previous CENTUM versions that have been the hallmarks of every release since 1975. Released in September 2011, Release 5 provides major enhancements relative to integrating field digital data, integrating subsystems, and integrating plant information. CENTUM's basic architecture is based on process controller, human machine interfaces, and process control network components. CENTUM VP Release 5 provides full backward capability with previous CENTUM VP releases and earlier generations of the CENTUM series, and also maintains upward compatibility for users of other CENTUM systems who wish to upgrade to CENTUM VP Release 5. 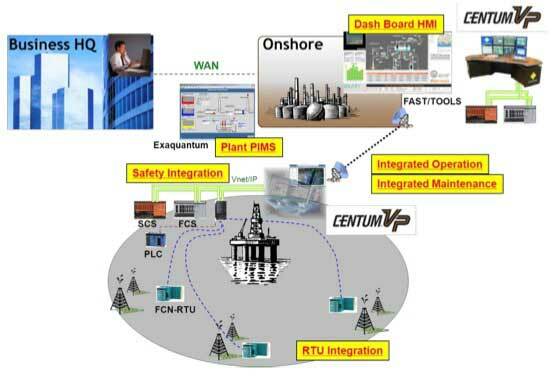 Yokogawa designed CENTUM with high availability of plant operations in mind. 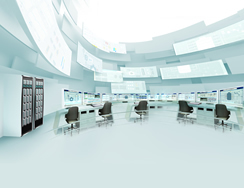 By design, the Field Control Station (FCS) continues to function even in the absence of a Human Interface Station or higher level server application, and sophisticated "pair & spare" redundancy schemes provide up to 99.99999 ("seven nines") controller availability. The fundamental controller functions of processing data, executing control logic and procedures, and outputting signals to final control devices are all performed in the FCS. As a leading automation supplier to the refining, petrochemicals, and other demanding process industries, Yokogawa prides itself on the robust capabilities and high performance of its CENTUM process controllers, which are entirely designed and manufactured by the company. CENTUM process controllers include proven algorithms and blocks for advanced regulatory control and batch control, as well as basic regulatory control. An early supporter of FOUNDATION fieldbus technology, Yokogawa was one of the founding members of the Fieldbus Foundation, one of the first companies to pass host interoperability testing, and has served actively on many Foundation committees to help advance this important international standard for digital field communications. Today, Yokogawa provides robust support for FOUNDATION fieldbus and most other major field protocols and the company can claim some of the world's largest fieldbus installations as its clients. FOUNDATION fieldbus digital communications between the intelligent field devices and the CENTUM process controllers provide important benefits in the areas of installation savings, commissioning savings, and ongoing operational savings and performance. In the years before DCS, most operator interaction took place from a hardwired panel control board with dedicated faceplates for each measurement, control, and alarm function. From this control panel, operators controlled the process, handled alarms, and viewed current and historical information. The DCS transformed the way an operator interacted with the process, because with the DCS operators could view and interact with all functions from one shared cathode ray tube (CRT)-based HMI display device. Initially, these HMI devices were purpose-built at considerable cost by the DCS supplier. In contrast, today's CENTUM systems employ COTS-based liquid crystal display (LCD) hardware and Microsoft Windows operating systems and offer the user a choice of physical configurations, including desktop or consoles, and enable the operator to interact with the process via a choice of display views: intuitive process graphics, familiar faceplates, informative process trends, tuning displays, and unified alarm display. Initially, DCS suppliers designed and built their own proprietary digital communications busses to link the different system stations together into a cohesive network. High throughput, high speed, and high determinism were all key considerations to ensure that the network could handle the momentarily heavy traffic loads often encountered in process plants; that measurements, control signals, and other messages moved over the network in a timely manner; and that the messages actually arrived at the appropriate station. Over time, it became apparent that the industry-standard Ethernet technology used in enterprise-level business networks could be modified to meet the high-availability, deterministic data communications requirements in industrial process plants. Unfortunately, these modifications often tended to make the previously open and interoperable standard Ethernet closed and proprietary to that particular DCS supplier. 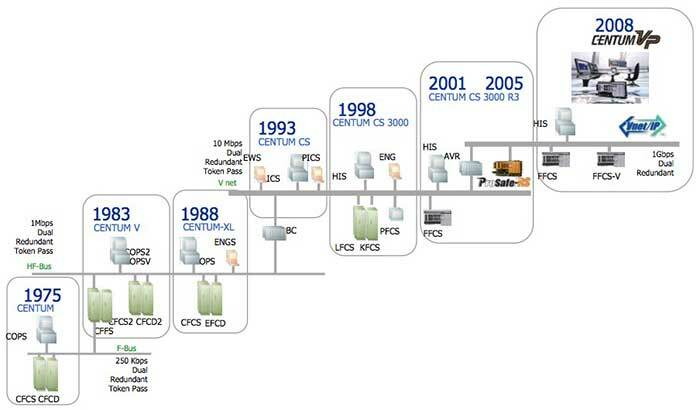 Most DCS suppliers have moved to high-speed, 1 Gbps, Ethernet TCP/IP technology for their process control networks. This provides more-than-adequate bandwidth and throughput for demanding process control applications, even in larger and more complex plants. However, to ensure the high network availability needed to ensure non-stop, around-the-clock data communications in process plants, DCS suppliers still have to modify the standard technology to accommodate redundant network topologies. This often adds proprietary elements that can make it more difficult than necessary to install third-party devices and applications on the control network. However, Yokogawa has taken what ARC believes is a unique approach with its latest Vnet/IP CENTUM VP process control network. After making the necessary modifications, the company submitted its TCP/IP-based Vnet/IP process control network as an open industry standard. The International Electrotechnical Commission (IEC) subsequently accepted it as part of IEC 61784-2 Ed.1.0. Users can easily connect both Yokogawa and non-Yokogawa components to this open, standards-based broadband industrial network. OPC has emerged as the standard method to interface third-party devices, sub-systems, and software applications into a supplier's DCS or other host system, enabling them to exchange needed plant data. However, this can result in a large number of different OPC servers and clients that need to be supported and managed over time, which can add unnecessary complexity, particularly during system upgrades. Virtually from the start, CENTUM supported all "classic" OPC technologies available at any given time: OPC DA, OPC A&E, etc. But, as we will see, the company has developed a "Universal Gateway" interface approach that simplifies OPC communications, is easier to manage and maintain, and enables CENTUM users to view data from third-party components as if they originated in a native component. What's New with CENTUM VP? With CENTUM VP Release 5, Yokogawa has made significant improvements in integrating field digital devices, integrating subsystems, and integrating plant information. Today's digital fieldbus technologies represent both a blessing and a curse for personnel in industrial process plants and place heavy demands on the host systems. Digital communications between intelligent field devices (transmitters, flowmeters, actuators, etc.) and the host systems helps reduce both installation and commissioning costs, and improves both measurement and control performance. However, many argue that the greatest benefits from the wealth of device data now available remotely to plant personnel. These include primary measurements, secondary measurements, device status, and multiple device diagnostic parameters. This is where the blessing and the curse come in. This type of real-time information can enable plants operate more efficiently and move to more effective, condition-based predictive maintenance approach. However, it can also overload systems and confuse users if not handled and managed properly. A common weakness of today's DCS controllers is the inability to process all this field device information in a timely fashion, without adversely affecting real-time process control performance. With the company's newly designed, high-capacity, high-performance Field Control Station (FCS), Yokogawa aimed to resolve this issue, enabling CENTUM VP users to realize maximum benefits from fieldbus technology. In today's modern automation world there are many I/O bus standards, some well-developed and some still evolving. A DCS architecture must accommodate the prevailing bus standards, as well as be flexible enough in design to accommodate emerging and future standards. The Yokogawa architecture utilizes a common form factor approach for communication modules for digital busses and modules for traditional analog and discrete I/O. These I/O modules are connected to the Extended Serial Backboard (ESB) bus, a communication bus connected to the control unit. Connecting network busses to the ESB through communication modules allows Yokogawa to provide digital network interfaces to current standards (FOUNDATION fieldbus, PROFIBUS–DP, Modbus RTU, Modbus TCP/IP, and DeviceNet) and to provide an architecture for interfaces to developing bus networks. The high cost of installing and maintaining conventional copper wiring means that a lot of field equipment, particularly equipment located in difficult-to-reach locations, remains largely invisible to the system and plant personnel for asset management purposes. However, with wireless field networks, many of these previously stranded components can now be cost-effectively integrated into the DCS. While currently, wireless field communications are used largely for equipment monitoring and asset management purposes, at some point in the future, we are also likely to see some process variables transmitted wirelessly for process control purposes. To support wireless field communications, Yokogawa has adopted the ISA 100.11a international standard, both for its own intelligent field instrumentation and for the CENTUM VP system. CENTUM VP Release 5 introduced users to new Field Control Station (FCS), which builds upon the reliability and performance which they have come to be expected from previous CENTUM controllers. The newly developed FCS (FFCS-V) builds upon the high reliability of the CENTUM "Pair & Spare" methodology providing, an availability of 99.99999 percent when configured with dual-redundancy. Each control processor has redundant CPU's that execute the same control computations simultaneously and then their outputs are compared. Assuming the outputs are equal, the main processor outputs to the final control device. If the outputs are not equal, the standby controller outputs to the final control device. This controller architecture offers other advanced features, including online maintenance, online module replacement, and online upgrades. 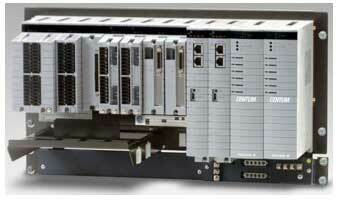 Some suppliers have different controllers to handle a wide range of different I/O points and control complexity. This can make the system more difficult to manage certainly increases spare parts inventory requirements. 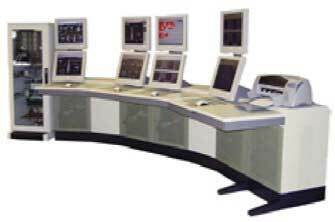 The Yokogawa approach is to use one controller to handle all ranges of applications. With a three-tier licensing scheme, users can scale the controller appropriately for basic, large, and very large system configurations (up to 1,024 stations and one million tags). In the early days of DCS, field devices typically only transmitted a single analog process variable signal for the controller to process and act upon. Today, a digital field device can produce well over a hundred different pieces of data, in addition to the process variable signal (or signals, in the case of multivariable devices). Because the FCS must input large amounts of both process data and field device data, the new FCS utilizes a newly designed synchronous parallel access method with both an I/O communication processor and main control processor functionality. This design optimizes the process signal used for real-time control, and the high volume of field instrument data used for asset management and performance optimization. To reduce wiring costs from field devices to the DCS I/O modules, DCSs require remote I/O capabilities. CENTUM users can locate I/O modules closer to their field devices to reduce field wiring costs. Other advantages of remote I/O include the ability to limit power to an area because of electrical classification and locate I/O in other areas due to space considerations. In addition to the system's copper coaxial cable remote fieldbus, a high-speed optical bus is also available for longer distances and for certain electrical classifications. This enables users to locate the remote I/O up to 50 kilometers from the FCS. ARC believes that in addition to serving as a platform for process control and plant-wide information management, modern DCSs should serve as an enabling platform to help improve plant asset management, not just for the system components themselves, but for all connected automation components and plant equipment. In this manner, in conjunction with appropriate condition monitoring and asset management software, the DCS can help industrial plants move toward a more effective condition-based, predictive asset management model. Yokogawa designed its Plant Resource Manager (PRM) asset management software tool for today's digital networks, such as FOUNDATION fieldbus, HART, PROFIBUS, and ISA100 wireless field networks. With the increased capacity and efficiency of the new FCS, the PRM software can work even better to manage field devices and their maintenance functions to help improve overall plant performance and reduce costs. PRM's diagnostic functions detect early signs of performance deterioration, enabling more predictive and proactive maintenance. Yokogawa also supports the FDT standard, which standardizes the human interface between intelligent field devices (sensors, valves, analyzers, etc.) and the host system. FDT provides a common environment for configuring and managing the field devices, including accessing the devices' most advanced features. CENTUM VP users can configure, manage, diagnose, and maintain any FDT Group-certified device using Yokogawa's FDT interface – regardless of device type, supplier, or communication protocol (FOUNDATION fieldbus, HART, PROFIBUS, ISA100 wireless, etc.). This allows users to preserve their engineering investment with existing devices. Today's DCS are the backbone of process control in the plant. However, single system can perform all the automation functions. Therefore, data from specialized subsystems, such as SCADA systems, safety systems, and PLCs must be integrated into the DCS. CENTUM VP Release 5 introduces a new gateway designed to greatly simplify this integration. 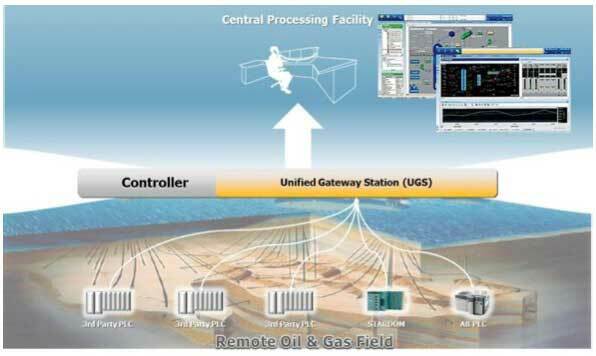 Yokogawa's new Unified Gateway Station (UGS) provides a common hardware and software platform for integrating subsystems. This includes both the company's own STARDOM SCADA subsystem and third-party PLCs. Where required, the UGS can be configured with redundant hardware modules and communications to ensure high availability. The UGS also makes these non-CENTUM Yokogawa and third-party subsystems look like CENTUM VP components to process control operators, providing a common operation and monitoring environment from the same workstation, using the same displays for all controllers. This common user interface improves operations and reduces operator training requirements. This unified approach to integrating subsystems greatly simplifies both engineering configuration and online maintenance which help reduce both costs and risks for users. The UGS is configured from a CENTUM VP engineering console and this engineering information is treated just like other CENTUM VP engineering data. The UGS converts the engineering data in the external controllers to CENTUM VP engineering data. This reduces the engineering man-hours required to configure CENTUM VP displays, alarms, and historian functions. The UGS has Smart Import, CSV Import, and OPC Browse Command functions to acquire data from the external controllers. With these software tools, tags and other data information are automatically generated, saving engineering time. In many process industries, plant personnel need to be able to make online changes to control strategies while the plant continues to operate. Utilizing UGS software utilities, control, maintenance, and engineering functions and associated tags for external controllers can be added, modified, and deleted without shutting down the process or the controller. The UGS can replace several dedicated, controller-specific gateways with one unified gateway. UGS I/O drivers acquire data from external controllers and update data within a specified time period. Function blocks in the UGS create a logical collection of data acquired from the I/O drivers and make this information available to other CENTUM VP stations, providing the same operation and monitoring parameters as FCS function blocks. While users expect robust and reliable process control capabilities from their DCSs, today, that's clearly just part of the story. Today's DCSs must also provide a platform for integrating, visualizing, and acting upon data and information from the DCS itself and a wide variety of other plant systems and subsystems (PLCs, SCADA systems, safety systems, analyzers, etc.). CENTUM VP Release 5 incorporates several important new capabilities designed to improve plant-wide information management. These include both the Unified Gateway Station previously discussed which acquires alarm data not accumulated by the DCS, and a new plant-wide Consolidated Alarm Management System (CAMS) that provides a powerful tool for enabling plant operators to respond quickly and appropriately to exceptions; preventing minor issues from escalating into major problems, enhancing safety and production availability, and minimizing creation of off-spec product. In combination with Yokogawa's well-proven Exaquantum plant information management system and other high-level software packages, these can provide users with a comprehensive plant information management solution. Prior to DCSs, individual plant alarms had to be hard-wired to annunciators in the control room. While relatively inflexible and costly to implement, this approach enforced a certain degree of discipline that meant that alarms were only implemented on truly critical parameters. In contrast, DCS software-configurable alarms in DCSs are relatively inexpensive to configure. This typically led to an overabundance of nonessential "nuisance" alarms that operators often just ignored or acknowledged with little thought. To fix this serious problem, ISA, EEMUA, and NAMUR developed standards such as for configuring and management alarms. 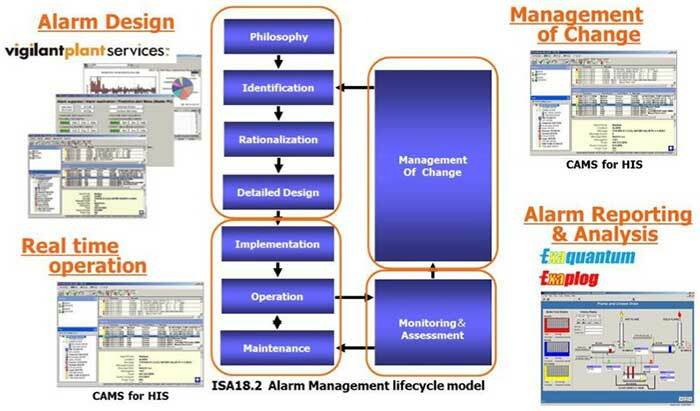 The ISA 18.2 standard, which incorporates both EEMUA 191 and NAMUR NA102, resolves many plant alarm management issues by providing a coherent lifecycle model that helps plants improve alarm management through effective management of change, alarm rationalization and design, and ongoing monitoring and assessment for continuous improvement. Yokogawa, along with most other major DCS suppliers, supports this approach. However, since many other plant-level systems can also generate alarms, Yokogawa has also developed a new Consolidated Alarm Management System (CAMS). This presents alarms from multiple integrated systems (CENTUM, STARDOM, ProSafe-RS, third-party PLCs, etc.) to appropriate operators, maintenance technicians, plant engineers, and/or plant managers, in a consistent manner on the same workstation display, providing a single window for all alarms using a master database approach. This helps ensure that the right plant personnel see the alarm and can respond in an appropriate manner quickly, effectively, and in the correct sequence. As the "backbone" of plant automation, many other types of automation and information systems must be interfaced to the DCS to provide important data. In the past, these interfaces required custom engineering and/or programming, making them both costly and "brittle," since modifications to the system could easily break the interface. CENTUM VP Release 5 solves this challenge with standard product offerings that minimize much of the need for expensive custom engineering. Yokogawa's process safety system, ProSafe-RS, is used for safety-integrated system/emergency shutdown (SIS/ESD), fire and gas (F&G) detection, and burner management system (BMS) functions. While the functional process safety guideline defined by IEC 61508 recommends a separation of process control functions and process safety functions (i.e., separate controllers), the growing trend amongst suppliers is to have a common operator interface and a common engineering/maintenance workstation for both control and safety. The Yokogawa system architecture supports this integrated operational and engineering/maintenance environment. Yokogawa's Microsoft Windows-based plant information management system (PIMS), Exaquantum, facilitates seamless information flow across different plant-level systems to provide operations-level decision support and between the CENTUM VP and enterprise resource planning (ERP) systems for business decision support. When used in combination with the company' advanced process control, alarm management, asset management, and other software solutions, Exaquantum provides a platform for plant to achieve operational excellence (OpX). While DCSs are optimized for use within an individual plant or industrial complex, they often must interoperate with the SCADA remote terminal units (RTUs) systems used to monitor remote operations such as pipelines, water & wastewater operations, or electric transmission & distribution operations. Using the FGS, CENTUM users can easily integrate needed information from Yokogawa's own STARDOM RTUs as well as from third-party RTUs and PLCs, which are often used in place of dedicated RTUs in less physically demanding remote monitoring and control applications. With today's more open and interoperable, largely COTS-based automation systems, cyber security is becoming more important as end users struggle with potential risks, both internal and external to the DCS. Most suppliers now address this threat with active programs, either in house or through partnerships. Yokogawa has built its security lifecycle approach upon industry cyber-security standards; plus its own internal product security policy that incorporates both global security standards and global engineering standards. Moving forward, Yokogawa has expressed its commitment to continue working with government and industry organizations and its customers to help identify and secure the CENTUM VP platform and the company's other automation platforms from future threats that might arise. ARC has identified a number of emerging technology mega-trends that we believe are likely to have a significant impact on DCSs and their users. With its Windows-based CENTUM VP operator interface and application architecture and IP-based process control network, Yokogawa is in a good position to capitalize on these trends over time. Just as people today find it hard to live without their smart phones in their daily lives, increasingly, process operators and production supervisors are relying on the ability to "access data anywhere, anytime" to perform their job functions. DCS suppliers address this trend by supplying tablet technology for roving operators and use of smart phones for alerts and condition monitoring. This trend towards increasing mobility will increase in coming years. Incorporating server virtualization is a trend that started just a few years ago by major DCS suppliers. Common uses of this technology include engineering development and for simulating automation in training. Within the DCS itself, ARC sees a big opportunity for cost savings and design flexibility to employ virtualization for the operator consoles. As an example, without virtualization, each operator console has its own dedicated CPU for performing operator functions. With virtualization, typically four or more operator consoles may be served by one virtual server. The DCS input/output (I/O) subsystem is responsible for inputting hundreds or often thousands of different process measurements and other inputs into the system, and outputting control signals to a large number of valves, actuators, motors, and other plant final control elements. I/O represents one of the most significant parts of the DCS, and traditionally, a significant cost element. However, DCS suppliers are working to reduce both the cost and the complexity of their I/O by incorporating more intelligence into the devices. The first smart I/O appeared in 2009 and since that time, other suppliers have initiated efforts to revamp their I/O subsystems to make them programmable and smarter. Unlike all other major automation suppliers, who have introduced multiple DCS offerings in the years since the DCS first appeared; Yokogawa has retained its CENTUM system offering. But even though the latest CENTUM VP Release 5 systems look, operate, and perform very differently than the original CENTUM system introduced in 1975, the company has worked hard to help ensure that users can always upgrade to the latest CENTUM technologies without obsoleting their current systems and applications. While backwards compatibility is laudable in many respects, it also makes it more costly and complicated for an automation supplier to leapfrog to the most current technologies. For more conservative users, particularly users who value robustness and reliability over the latest bells and whistles, this is not an issue. This helps explain why Yokogawa continues to be a market leader in refineries, petrochemical plants, chemical plants and other highly demanding industrial plants. To compete successfully in today's highly competitive business environment, manufacturers must achieve continuous performance improvements. However, the current shortage of internal engineering and other technical resources will make it very difficult for industrial organizations to identify, implement, and maintain the prerequisite plant improvements. With this in mind, Yokogawa offers a comprehensive lifecycle support mechanism for the company's clients facing these challenges. Yokogawa's VigilantPlant Services cover all three phases of an automation system's lifecycle with project services (engineering and design, project management, system configuration, commissioning and startup, etc. ); basic post-commission services (system maintenance, spare parts and replacement, decommissioning, etc. ); and more advanced post-commissioning performance services (advanced process control, plant optimization, cybersecurity, etc.) The combination of field instrumentation, automation systems, and basic and advanced services means that Yokogawa can provide its customers with complete automation solutions. According to ARC research, Yokogawa is very strong in certain industries (particularly refining and chemicals) and geographies (particularly Japan and Asia). The company's latest CENTUM VP Release 5 enhancements in the areas of field integration, automation subsystem integration, and plant information integration will go a long way toward enhancing the system's competitiveness, particularly in its established markets. But to meet the ambitious goals articulated by top management, the company will need to build up its customer base and expand market shares dramatically in industries and geographies where it faces intense competition from other well-entrenched, if not dominant, North American and European automation suppliers. ARC believes that, with the appropriate additional investments in both technology and marketing, Yokogawa could give some of these global competitors a "run for their money."